Are there hurting people in your church or community whose needs are going unmet? Can you imagine the difference it would make to have 10 or 20 lay caregivers in your church who are well-trained and ready to respond to people in need? More than 13,000 churches have learned an effective, proven strategy for equipping laypeople to provide high-quality, distinctively Christian care. Stephen Ministry Introductory Workshop will be held from 9 a.m. – 1 p.m. Registration begins at 8 a.m., and refreshments will be served. This workshop is an excellent opportunity for church leaders and other members to learn about the Stephen Series, a ministry system that equips and mobilizes laypeople for effective caring ministry. The cost is $15 per person or $50 for a group of four or more from the same congregation. 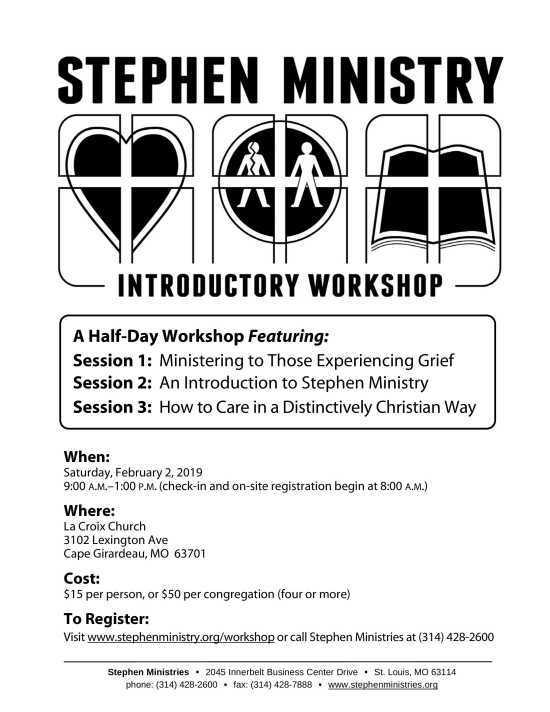 For more information, or to register for the Stephen Ministry Introductory Workshop, call Stephen Ministries at (314) 428-2600. You can also register online at www.stephenministry.org/workshop.